Arthur D. Little has been a pioneer in risk management, including safety risk management for over a century - highlighted by numerous landmark assignments. Today, we have deeper insight and broader proven capability in this field than any other leading strategy consulting firm. Our key differentiator is that we are able to bridge the gap between detailed operational or technical risks, and the strategic business decisions taken at Executive / Board level. Our independent review/ assessments provide deep insights into your operations, and rapidly diagnose the strengths, weaknesses, and gaps against identified good practice benchmarks. These services are applicable to all aspects of risk management, including specialist safety reviews, where our in-depth domain knowledge is a particular advantage. These are often the ‘first step’ of our client engagements and provide strategic direction and priorities for strengthening risk management. We are experienced working alongside our clients in reviewing their corporate risk management framework, governance processes, policies, and risk culture. We benchmark these against good practice and established international standards to develop the most appropriate improvement roadmap that reduces risk management costs, improves business performance and strengthens stakeholder confidence. Our risk profiling evaluates our clients’ exposure and tolerability to risk, using a ‘top down’ approach. This includes the identification, assessment and prioritisation of all key risks to strategy, assets and operations. We support our clients in developing their specific risk profile, or reviewing their existing risk profile, to improve capability in anticipating change, emerging risks, and operational disruption, leading to better informed corporate planning. We have provided high value, independent safety reviews to a wide range of multinational companies, giving our clients a powerful diagnostic into the effectiveness of their safety management, governance, leadership and performance. Our approach goes beyond compliance and looks at the effectiveness of arrangements in practice, particularly at leadership and governance, and actions on the ground. Our reviews typically underpin significant group-wide improvements in safety performance - one of our clients has reduced their total global level of harm by 70% since we began our work. We have a proven track record of developing and implementing group-level programmes for improving safety performance. We tailor these ‘Safety Development Programs’ to the specific challenges faced by the business, and pull together key elements, including leader safety awareness and competence, program management, standards development, and the corporate dashboard, to drive a cultural change in safety leadership, safety management and performance. Our programmes deliver results because we strengthen the accountability that is held through the line management structure of the Group – not working simply as a bolt on to the safety team. We have been delivering bespoke safety, risk and assurance training to high hazard industries internationally for over 20 years. Our training providers are the best in the business as they bring extensive industry experience and industry knowledge into the learning environment. We work alongside executives to build competence in safety leadership and strategic safety and risk management. Our course materials are tailored for you, and are built on a solid base of tried and tested case studies in a range of languages, covering safety leadership and engagement, accident investigation, risk management, process safety, auditing and risk assessment. Our senior consultants provide one-on-one coaching to executive level clients in risk decision making and leadership. We support clients to improve business performance by striking the right balance between risk retention, risk mitigation and risk transfer (e.g. insurance). 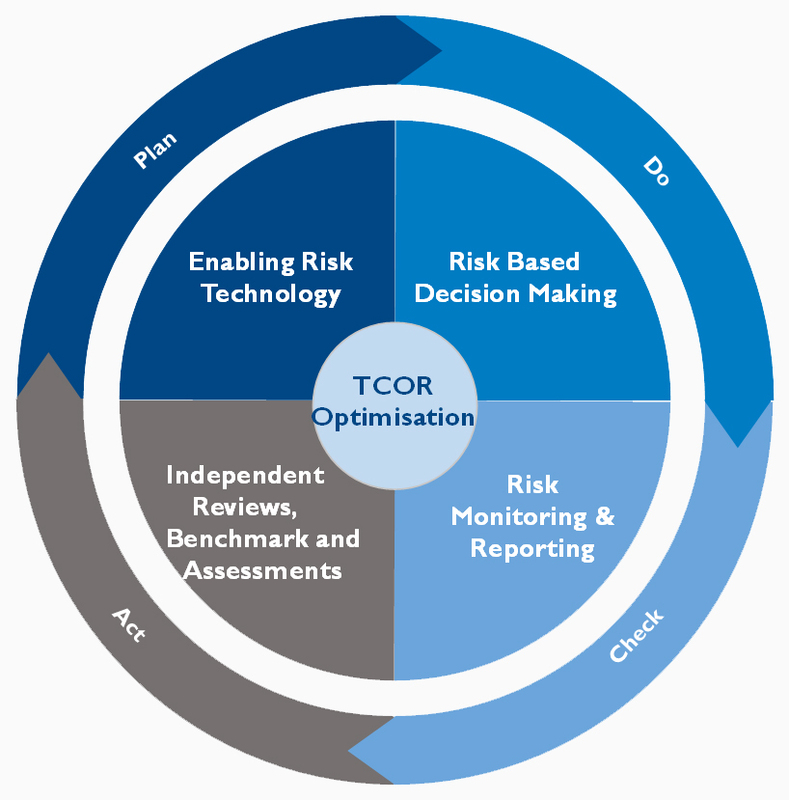 The TCOR service provides tangible benefits of increased visibility of risk management activities, driving greater focus on strategic objectives and implementation, achieving resource optimisation and substantial cost reduction. We bring functional risk expertise together with insights into organisational culture that in our experience are critical for building effective results. We can develop the TCOR formula for you and maximize returns using TCOR optimisation thereby providing assurance that risk management is working and helping to deliver business objectives. We support our clients in developing robust, risk-based decision-making processes. In particular, our deep dive approach means that operational and technical risks are translated into financial insight that helps drive more effective capital and resource allocation. The outputs of our work presents focused and useful information about risk (e.g. operational, financial, strategic and political) and associated trade-offs to support decision-making and ensure that risk can be taken on a controlled and informed basis. We address the complete range of fully and semi-quantified risk assessment approaches to provide clients with a robust, defensible answer to precipitate action. The approach includes cause and effect analysis, risk assurance mapping and risk modelling. Our decades of experience include the delivery of many proven techniques such as Bow Tie (Cause and Effects Analysis), Hazard and Operability Assessment (HAZOP), Safety Integrity Level (SIL) assessment and Fault Tree Analysis (FTA). We have proven abilities in building complex models that better exploit the value of new sources of business management and operational data, enabling informed decisions and driving business efficiency. We pride ourselves on delivering the results based on all available information and analysis in a format that supports Executives in strategic decision making. Project risk management strategy development to manage and mitigate project risk, this includes assessing intangible social risks during project feasibility studies and building trust with regulatory bodies and stakeholders. Companies’ risk profiles are becoming more complex and more dynamic with the emergence of new digital technologies and reliance on large networks of suppliers and third parties. We help our clients strengthen their confidence that risks are well understood by developing effective and dynamic risk monitoring and reporting, moving to a proactive approach to risk management. Our work provides true insights into risk, and assurance to senior management that risk management strategies are effective and robust. We work with our clients to develop appropriate rules for effective aggregation and escalation so the right information reaches the right level in a timely manner. We also support our clients in developing and implementing risk indicators, which enable continuous risk reporting and automatic visual flagging of control gaps. We recommend enabling risk technology to our clients to unlock integrated and holistic approaches to risk management ensuring the right data gets to the right people at the right time. These approaches can drive performance improvements that are well-aligned with governance, risk, compliance and HS&E requirements. We help our clients to streamline their businesses processes and assess the various technological solutions/platforms available to improve the collation, interpretation and reporting of data. We use technology as an enabler for visualising risk, providing a basis for decision making and moving from insights to action. To achieve the required synergies with our clients, we identify opportunities for integration, using business intelligence and Artificial Intelligence techniques to ensure that an ‘input once, use many times’ approach can be adopted. Our clients usually have large quantities of data, and what we bring is the insights required to generate value and action from this data. Once the right technology has been identified, we support the design and implementation of appropriate change programmes to embed systems on an enterprise wide basis, demonstrating early business benefit from reduced administration and handling costs. We ensure that solutions are flexible, to support the ever changing business needs of different organisations, and that they are able to track and monitor performance through a Total Cost of Risk (TCOR) approach.